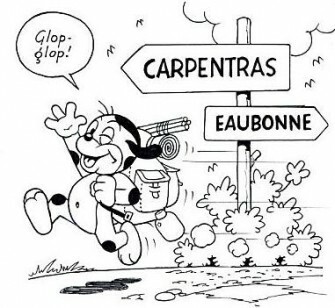 Roger Masmonteil, the illustrator who worked as Roger Mas on a variety of humorous French-language publications and who was the creator of the character Pifou during a lengthy run on Pif, died on August 28 after a lengthy illness. He was 86 years old. Masmonteil dabbled in cartooning while holding a variety during and just after World War II. He succeeded the cartoonist Jose Cabrero Arnal on series in the publications Avant-Garde and L'Humanite. Masmonteil also branched out into illustrating other works in partnership with some of L'Humanite's writers. His big break came when he succeed an ailing Arnal on the popular daily Pif Le Chien strip in L'Humanite and then the Pif comic that appeared in Vaillant. While on Pif le Chien Masmonteil introduced a son (although one without a mother nearby) named Pifou, who later spun off into his own works. He also worked on the strip Spoutnik for a decade, ending in 1965. In the late 1960s, Masmonteil shifted his career emphasis from the Pif comics, but maintained both Pifou and developed his own series for Pif Gadget called Leo Bete a Part. He would also do Kesako for the magazine Tintin in 1968-1969. He would eventually retire, in the early 1990s, although is friend's tribute mentioned that he continue to make creative plans.